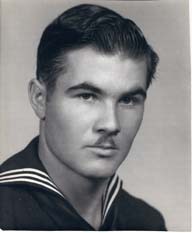 Dave Jones joined the Navy at age 17. On April 19, 1941, sixteen days after his 18th birthday, Able Seaman Jones stepped aboard the battleship U.S.S. West Virginia. Eight months later, Dave was a Pearl Harbor survivor. Immediately after the West Virginia, sank, Dave was assigned to the destroyer U.S.S. Monaghan. The Monaghan fought at the Battles of the Coral Sea, Midway, and at Komandorski Island. The latter was the longest surface ship battle of the war lasting over 4 hours of continuous combat. The Monaghan is credited with destroying the Japanese sub I-7 in April 1943. In early 1944, Dave was assigned to the LSD U.S.S. Lindenwald, which served throughout the Pacific war, including the landings at Kwajalein and Saipan. His last shipboard assignment was to the destroyer/minelayer Aaron Ward, supporting the landing at Okinawa. Japanese kamikazes repeatedly attacked the Ward, as she suffered a total of 5 hits plus two bombs. The ship was taken out of the line, and limped all the way to the Brooklyn Navy shipyard on one screw, making 5 knots. Dave was 23 years old, and served in the Pacific from Pearl Harbor to the Battle of Okinawa. He survived Pearl Harbor, and a total of 17 battles. He was torpedoed, bombed, strafed (in the water swimming to Ford Island), attacked by naval surface fire, and hit by kamikazes; and yet he lived a full life. Dave passed away on January 22, 2012, at the age of 88.